Welcome to a new Blog thread from me! Since taking over as the Association's Publicity Officer in October 2007 I have gradually been refining the 2mm Publicity Stand with new display materials and features. I've had a lot of help from other members on the way of course and the '2mil Roadshow' is starting to get noticed and invited to more shows. I think Society stands are so much better if they have some sort of movement on them, whether it be a live modelling demo or trains running and being shunted etc. With this in mind I have determined to build a compact demonstration layout as an adjunct to the Publicity Stand. I have also decided to enter it into the GJLC to give me the incentive to hack it within 12 months or so. What am I aiming to achieve with this new micro-layout? a) It should be a long and thin layout that can sit on the front edge of a standard 6 foot trestle table and still allow plenty of room for the stand staff to model, hold court etc. 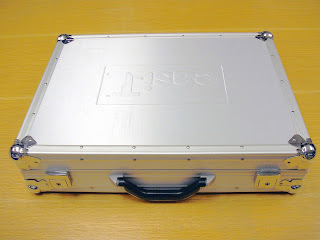 b) For ease of transport to and from exhibitions itt should pack away as small as possible in one hand-held carry case. c) The track plan should be simple and yet prototypical. d) It should showcase the latest Association products and techniques. e) Simple shunting operations should be possible using electro-magnets and various delayed coupling systems. Reliable delayed action auto coupling systems always impress the punters! f) Designed for both DCC and DC operation, according to the preferences and stock available of those manning the stand. g) It should be modelled to a high standard in all respects but at the sime time appear as something achievable by a potential member viewing it. The interior dimensions are approx 20" x 15" x 4". I have been much impressed by Anthony Yeates' micro layout that folds in the middle and lives a box-file. It didn't take me long to work out that if I made a layout that folds in two places I could have three boards each 20"x5", giving a total size of 60" x 5", ideal for the front of a trestle table and have it fit snugly in a fairly decent case that had cost nowt (as we say in Yorkshire). 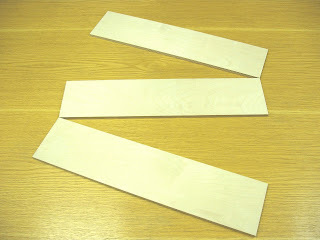 The three baseboards are to be made from 10mm birch ply and were very kindly donated to the project as a kit of ready-cut parts by friend and member Alan Smith. Through his business Alan has access to some high-tech CNC woodworking machinery and can knock out baseboard components very quickly - see the curved boards for Tony's 'Braffertion' project which are from the same source. I collected them from Alan at Ally Pally last weekend where he was demo-ing Easitrac turnouts to great acclaim. 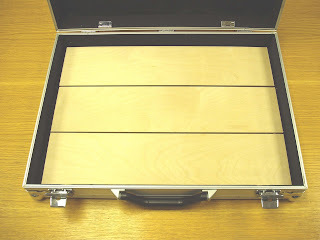 The shot above shows the three track deck boards laid into the case and the shot below shows how the boards will fold sideways. 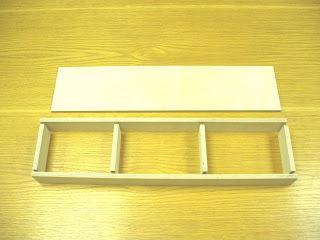 The shot below shows the kit of plywood parts for one board, which will be glued and screwed together. However before doing this the end pieces and intermediate cross members need hole-sawing to provide wiring ports. The intermediate cross members will only be added once turnout postions have been finalised. With each board only being 500 x 120mm I'm looking forward to being able to work on them at my normal workstation - they are really tiny compared to the one-piece 1500 x 500mm of Niddbeck Bridge and the 1200 x 600mm boards of Pool-In-Wharfedale. In the next instalment I'll reveal the general layout design, it's track plan and the prototypes that inspired it . I was wondering what the contents of the little package would look like.! This is tip top and bang on for the thread of the next few group meetings. As Mick said, now I know what the packet passed to you on Sunday contained. What a clever idea, it has given me food for thought for a future layout, So please blog away, I don't mind borrowing other peoples ideas!! I agree that the Assoc. stand looks better for having a small layout as it attracts people who would otherwise walk by. I noticed this at Ally Pally where Marks Quay stopped a number of people for a closer look, where a "bare" stand holds no attraction for them.